We have had beautiful weather the last couple of days…right before it gets cold again later this week. I am ready to get out in the garden. We still have some more prep work to be done before. It is a great time to plant cool weather veggies like cabbage, lettuces, broccoli, peas. I probably should already have those out, but time has prevented me from getting around to that yet. We planted some seeds in several seed trays this year but because of the soil, they quickly popped up and then promptly died? We planted our fall pumpkin seeds in some seed trays and they are nice and big now. Not sure what we will do with those since it isn’t pumpkin planting time yet? Still, there is a simple math about planting your own garden. “If a person has been laid off, and had a finite amount of money, they’re looking at spending $2 for a head of lettuce that’ll last two days,” says Greg. I know these times sure have made us think about spending and saving differently. 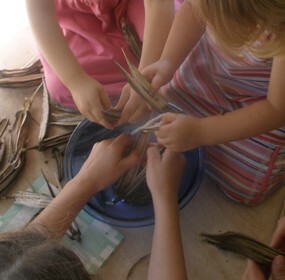 The kids are collecting okra seed from last years okra pods. I wished you would have grab me, it would have been great to meet you! The Leadership Summit was a whirl wind of action though. Hopefully we will be able to connect in the near future. It would be great to hear about your journey. Paul, I almost had the pleasure of meeting you at the Leadership Summit this past weekend. I was pleasantly surprised when I saw your name tag as you passed by while I was talking with someone and was not able to say hi and then did not see you again after that. I have enjoyed your blog for some time now. Our family has been praying and seeking God as we feel him leading us down a path which may well be similar to yours. Blessings on your family and look forward to connecting with you in the future!